The last week and a half have been .... both very cool and very sad. Everyone is leaving, and these are situations where I can't help but cry buckets. Since I'm practically one of the last three of our core group to leave, I've had to say goodbye to someone practically every second night or so. These people have been like my family for the last five months, and it's hard to accept that I don't know when or if I'll ever see them again. Who knows what the future holds, but in the present moment, it's just sad. Me and Julie went on two trips this last week, to fill up the time before I go home, and she continues on to travel Europe for a month! We went to Belfast last weekend, and Killarney during this last week. Belfast is still a very troubled city with the obvious divide between Catholics and Protestants. We took a black taxi tour our first day there, which goes through the political history of the city and Northern Ireland. With the accent and the rate at which he was talking, it was hard to understand at times, but the main point is that even though the city is functioning at the moment, there's still a lot of unrest and tension. There are two obvious religions, two segments of the city, and even some pubs are part of that divide. Parts of the city are gated, closing at night, and some houses that are near the divide between the two city segments have cages around their backyards. It's sad and kind of disturbing. Long story short, it's not somewhere where I would want to raise kids. With such an influence from Britain, it also reminded us of a mini Irish London. The buildings were big, old, and the side streets were reminiscent of the white clustered buildings of London as well. We also took a tour to Giant's Causeway from Belfast, and it was really pretty. The actual causeway was smaller then I expected, but it didn't matter too much because everything in Ireland is gorgeous. I could be in a random field of green surrounded by sheep and be happy (as long as the sheep weren't too close hehe). We came back to Waterford on Sunday night, said more goodbyes, and then left Monday morning for Killarney, which was absolutely brilliant. Within the first ten minutes of walking around the town, I knew I was going to love it. It was quaint and cozy, kind of like Waterford. We were welcomed that day with pouring rain though, so we chilled at the hostel for a bit, before deciding to brave the weather and go for a walk through Killarney National Park anyways. Half the time, Ireland weather changes so much that within ten minutes the rain goes away, ten minutes it's back, and so forth. However, that was not the case this time, so we only walked for about 15 minutes into the park before we turned back around. That was ok though, as we did go back both Tuesday and Wednesday night, exploring with much better weather. On Tuesday, we took a tour through the Dingle Peninsula, and by far, this was the best tour I've been on. We stopped at a whole bunch of gorgeous places and wandered through the town of Dingle for a bit, stopping for possibly some of the best ice cream I've ever eaten. It might help that it was coffee flavoured infused with Jameson whiskey ;) Later that night, we went out for drinks at a pub that was recommended to us by the hostel. The environment was really snug and cheerful, though they were unfortunately out of the beer I wanted, so I tried a stout beer called Beamish instead, which is produced in Cork. I also sampled a pale ale that's brewed in Dingle, called Creans. Both were actually pretty good. The shock. Wednesday we went to the Ring of Kerry, which was a day of ups and downs. The first half of the day wasn't anything spectacular, which was disappointing after having such a great day the day before. The second half improved though - we saw a lot of really majestic looking mountains, which you can never go wrong with. When we got back to Killarney, we stopped again for ice cream, and I got the coffee with whiskey again, and rum and raisin..... because when in Ireland ;) After walking through the Park again, we went out to.... wait for it..... The Shire Bar! It's a Lord of the Rings themed pub and it was actually great hahaha. They even had five or six themed beers! - I had a tankard of Barliman's Best, and Julie had Gandalf's Ale. It was cooler then it sounds, ok? Also on our tour to the Causeway, we stopped at Carrick-A-Rede, which is this basically just this little rope bridge that you cross, and gets you to a little island. What's on this island, you may ask? Nothing. Absolutely nothing. I paid five euro to cross a bridge and see the same thing I could see on the other side hahaha. But, hey, it was a cool experience! Fast forward a couple days, and this is on the tour to Dingle! We stopped at a place called Inch Beach, which was gorgeous. Being me however, I have decided to not post a picture of the beach, and instead post a picture of words, because I loved this. It was on the wall of the one little shop on the beach. I have a serious obsession with green hills. Is it sad that I sort of love the bus rides here because I can just stare out the window forever and not get bored? I haven't even left yet, and I already miss all the green. When in Canada, would a random walk through a park lead you to a castle that looks like this?! This was Ross Castle in Killarney National Park, and it was amazing. Everything in Ireland is so pretty, and while I try not to take any of it for granted, it is inevitable that eventually a castle is just another castle. For some reason though, maybe because the end is so near, when we got to this spot, it somehow hit me all over again where we were and the immensity of it all. 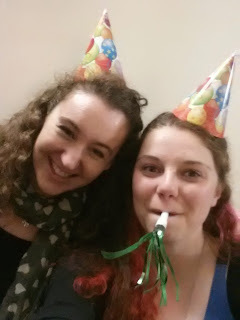 So, here we are, with birthday hats and streamers, celebrating.... no one's birthday in particular hahaha. And, that is it. The last blog I'll be writing in Ireland. I'll write my official last one within the first week that I've been back, summing everything up, and probably getting way too deep haha. Feelings about coming home are definitely mixed. I'm obviously very excited to see my family and friends again, and to have the comforts of free laundry and hot water. I'm excited to drive, to go to Tim Hortons, and I'm definitely ready for warm weather.